When Lithuania was rebuilding after the first world war, the question of land ownership was a very vital one. This is easily understandable since 75% of the inhabitants earned their living by farming. At the same time, 2,397 landowners owned 41.5% of the land, leaving 60,000 landless families and 40,000 families of small holders to survive as best they could. This unjust distribution of land was the outcome of a long history. As late as the thirteenth and fourteenth centuries, most peasants in Lithuania were free and owned their own land. But with the emergence of a noble class, the feudal system was established and free peasants became serfs. A peasant became bound to an estate. For the right to till for his own benefit some of its land, he had to pay by working on the lands of the estate and paying taxes in money and produce. The condition of the peasant deteriorated further after the third partition of the Polish-Lithuanian commonwealth, in 1795. The Russian form of serfdom was more severe than the Lithuanian. In Russia, the lord considered himself the owner of his serfs and enjoyed unrestricted power over them. By the decree of August 22, 1767, the empress Catherine II prohibited appeals by serfs to anyone against their lords and, thus, the serfs had no recourse but to suffer whatever their lords did. The partition also meant that many Lithuanian estates were granted to Russian noblemen, supporters of Catherine's policies, who helped to spread the Russian customs. Serfs could be punished by whipping, branding, and death. They could be forced to kneel on heated stones, tied to posts, imprisoned in cellars, sold, and traded. On some estates, the statute labor required was very severe, six days per week by two members of a family. Such serfs were unable to work their own land except at night and on holidays and, thus, their food was very meager. Besides this, serfs had to pay taxes to the state, were liable to twenty-five years of military service, and were called on to transport and quarter troops. The oppressive burden of serfdom resulted in peasant riots and revolts and agitation for the improvement of the economic status of serfs. In places, even the army had to be called out. This unrest became a threat to the survival of the state and forced the abolition of serfdom. On February 19, 1861, Alexander II formally abolished serfdom. Peasants were set free and were given, as their own, the land they had tilled for their own use, but had to make redemption payments for forty-nine years. The abolition of serfdom did not end the injustice. Since those who had not tilled any land for their own use were not entitled to any land, hired laborers received nothing. Other peasants were set free before the abolition and once again were entitled to nothing. In other cases, peasants were not given the land they had worked, but only a portion of it or other land of poorer quality. And thus, many remained without an adequate source of income or with none at all. These, had to hire themselves out or rent land from the estates, on the landowner's terms. Lithuanian landowners were not able to adjust to the new economic conditions brought about by the abolition of serfdom and many of them did nothing to maintain and improve the productivity of their lands. After the revolt of 1863, in which many landowners took part, the Russian government imposed very heavy taxes upon Lithuanian estates and did not grant them loans easily. Year after year, Lithuanian landowners sank deeper into debt. Before the first world war, 90% of the land area of the estates was mortgaged. The indebtedness of many estates reached 100% of their worth. The debt laden estates could be purchased by Russian colonists on favorable terms, while land purchases by Lithuanians were very severely restricted and, in 1901, completely banned. To cover the expenses of a prodigal way of life, many landowners sold their forests and, in this way, despoiled the country. In 1861, forests covered a third of the total area of Lithuania, while just before the first world war, only 21%. Thus, a third of all the forests Were destroyed. Most landowners in Lithuania were either Polish, Russian, or German and had little sympathy for the Lithuanian national revival which developed in the second half of the nineteenth century. While in Poland, landowners led and financed the Polish nationalist movement, in Lithuania, they acted in the opposite direction. The estates were centers of Polish culture from which it spread to the rest of the country. In some parishes, landowners pressed the clergy to use even the church for spreading Polish influence. In 1918-1920, many children of Lithuanian landowners joined the Polish army and, thus, fought against Lithuanian independence. Others worked to bring about a Polish revolt in Lithuania and to unite Lithuania to Poland. In the northern part of the country, German landowners supported the army of Bermondtists and hoped to incorporate Lithuania into Germany. At the same time, the Red Army was moving into Lithuania from the east and was proclaiming bolshevism to the landless and small holders. There was a grave danger of a revolutionary movement springing up within this group. For all of the reasons mentioned above, the founders of independent Lithuania had to undertake a very radical land reform to try to remove the injustices which had oppressed Lithuania for centuries. The issue had been alive for many years before this. One of the leaders of the revolt of 1863, the rev. Antanas Mackevičius, promised the peasants land. After the revolt, the first to raise the question again was Jonas Šliupas in 1886. At the time, he was heavily under the influence of socialism and advocated the socialization of land. Petras Leonas, in an essay published in the underground periodical Varpas (The Bell), No. 5, 1891, suggested certain reforms. In his view, the ideal solution would be to introduce the communal control of land, but this was impossible because of the individualism entrenched in Lithuania and in Europe generally. He argued that the government should undertake certain reforms: rent out to farmers certain estates; establish credit institutions to serve the needs of farmers; establish schools of agriculture, trade, and commerce; lower and make more equitable the land taxes; regulate the amount of interest to be paid on loans. Lithuanians themselves should send their children to schools; establish among themselves credit institutions and firms to supply farmers and market their products; establish private schools of agriculture, trade, and commerce; as quickly as possible enter business and the various crafts, in order to decrease competition among farm workers and establish themselves in more profitable occupations; to establish societies and with the help of an "agricultural bank" purchase land, especially that of estates. The land question was sharply raised at the Great Seimas of Vilnius in 1905, where the some 2,000 delegates demanded autonomy for Lithuania. With the exception of marxist socialists, who demanded the nationalization of all estate and church lands, all the others agreed that the estates should be purchased and then distributed to the landless and small holders. Only government lands, those received as a gift from the government, and those illegally obtained from peasants could be taken over without payment. To purchase estates, a national fund was needed and this could be established only by an autonomous Lithuanian government. The demand for autonomy of the Seimas of Vilnius was rejected by the czar and with this the idea to purchase estates died, at least on a large scale. A private corporation, Artojas (The Plowman), was organized — most of its members were priests — and this bought up. estates at auctions, divided them up into smaller parcels and sold them to the landless on favorable terms. Artojas had purchased some 12,000 acres, but the first world war interrupted its work. In spite of this declaration, it is still true that the idea of land reform had to be shaped and put into practice by definite persons. Since the government was in the hands of the Christian Democratic Party5, this task fell upon it, and in particular upon its leader in the Founding Seimas and later minister of agriculture, Msgr. 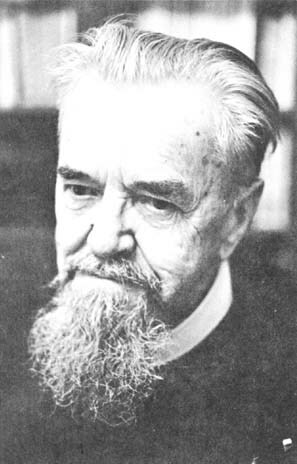 Mykolas Krupavičius. Eventually, Krupavičius' father lost whatever money he had and leaving behind his wife and four small children emigrated to the United States to seek his fortune. However, he was injured in the factory where he worked, did not receive any compensation and, as an invalid, entered a rest home. Once, he was asked to sweep the street and while doing this was struck by a passing truck and died from this injury in 1916. The mother could not afford to educate her son. And so, after completing primary school, Krupavičius decided to become a blacksmith. However, he followed the advice of a friend and enrolled in the teacher's college at Veiveriai, a school which even the poor could afford. At the teacher's college, Krupavičius engaged in anti-Russian activity and in 1905, the year of his graduation, took part in the revolution. He was appointed to a teaching position in Poland and spent two years there. In Poland, he noticed how different the Polish landowners were from those in Lithuania. The Poles organized agricultural societies and cooperatives and were concerned with the education of the peasants. Most of their counterparts in Lithuania were intent simply upon exploiting peasants. Krupavičius wanted to become a forester, but upon learning that a Lithuanian forester could not be employed in Lithuania, he withdrew his application. At the time, only Lithuanian priests, doctors, and a few lawyers were allowed to work within Lithuania. All other professionals had to seek employment elsewhere. Since Krupavičius had not completed high school, he could study neither law nor medicine. Since he wished to remain in Lithuania, only one course remained open, the priesthood. With strong religious convictions, at the age of 23, Krupavičius entered the seminary at Seiniai. At the seminary, he devoted a great deal of attention to social studies, especially the social encyclicals of Leo XIII and the social writings of the rev. Jurgis Matulevičius-Matulaitis. From Seiniai, he was sent to the Spiritual Academy in St. Petersburg where he continued his studies of Catholic social thought, particularly as it affected the right of ownership. Krupavičius' program of social reform matured fully while he was in St. Petersburg. He was very impressed by the book Papes et paysans by G. Ardant which had been published in a Polish translation in 1906. This book studies papal attitudes towards property since the thirteenth century. According to the popes, property rights are to be established by the state in the light of the common good and not simply in terms of the interests of the owners themselves. Ardant refers to the case when the pope allowed anyone to till as he saw fit and for his own benefit a third of all the unused lands within the pope's jurisdiction, regardless of whether they belonged to monasteries, churches, or private owners. When in 1919-20, Krupavičius had to defend his own views on land reform, following the work of Ardant, he published Kova už žemę ir laisvę (The Struggle for Land and Freedom), in which he tried to show that his program of land reform was compatible with the teachings of the church. The Russian revolution of 1917 increased Lithuanian hopes of obtaining independence. Numerous Lithuanian political groups were very active both in Lithuania and among Lithuanian refugees in Russia. Upon completion of his studies at the Spiritual Academy, Krupavičius was appointed chaplain of the Lithuanian gymnasium in Voronezh. In Voronezh, he became involved in a great many activities. Among these, he was elected chairman of the Voronezh chapter of the Lithuanian Christian Democrats. A congress of Lithuanians was being organized in St. Petersburg for May 9-16 of 1917. Krupavičius was elected one of the four representatives sent by the Voronezh colony. Many Christian Democrats attended the congress in St. Petersburg. These delegates held a separate Christian Democratic conference where they adopted a program for the Christian Democratic Party which applied the principles of the encyclicals of Leo XIII to the conditions of the day. The program included a project for land reform. After this conference, the Christian Democratic center was moved to Voronezh and Krupavičius was elected chairman of its central committee. Communist activity and terror was on the uprise. The efforts of Lithuanian communists led to the arrest of some Lithuanians in Voronezh. Krupavičius himself, in absentia, was condemned to death. Thus, he had to leave Voronezh and eventually returned to Lithuania. In Lithuania itself — then under German control — Christian Democrats were also organized and had adopted a program which was somewhat milder than the St. Petersburg one. When in 1918, the refugees returned to Lithuania, these differences became apparent. On November 20, 1918, a Christian Democratic conference met in Vilnius to iron out the differences. Krupavičius was elected chairman of the unified party and was obliged to prepare a program for it. Krupavičius favored the more radical program of St. Petersburg which, however, because of its radicalism, had many critics. Krupavičius sought support for his own position among the Lithuanian bishops and, with this end in mind, invited Jurgis Matulevičius-Matulaitis, then bishop of Vilnius, to assist him. Together, they wrote the new program. Since in the several parliaments up to the spring of 1926, the Christian Democratic block was in the majority, its voice determined public policy. And thus, the program prepared by Krupavičius and Matulaitis served the new Lithuanian state in a very important capacity. The land reform project of the Christian Democrats was as follows: 1. in order to supply land to the landless and small holders, a land fund is to be formed, its holdings to consist of confiscated government lands, lands of the peasant banks, lands received by their holders as gifts from the Russian government, lands obtained illegally, and lands purchased from those whose holdings exceed the legal maximum; 2. no single landowner can have more than 190 acres7; 3. everyone without land and every small holder is to receive from 19 to 48 acres, depending upon the quality of the land, with rights of ownership; 4. no private individual can purchase land above the legal maximum. Since Lithuania was hard pressed to maintain its independence, in order to encourage men to volunteer for military service, it was promised that volunteers would be the first to receive land in an exceptionally rapid way. This land reform project was met with strong opposition. Its severest critics were Polish landowners who went so far as to accuse Krupavičius and Pranciškus Karevičius, the bishop of Kaunas, in the Vatican and appeal to the League of Nations. The other political parties — the Social Democratic Party, the Populist Peasant Party8, and the Nationalist Party,9 — agreed in principle that land reform was necessary, but disagreed about the way it should be carried out and about the maximum amount of land each landowner would be allowed to retain. The Social Democrats wanted to nationalize all estate and church lands and to establish something like collective farms. The land was to be expropriated without any compensation. The more left wing of the Populist Peasant Party advanced similar views. The right wing, on the other hand, called for a legal maximum of only 120 acres and for the expropriation of all church lands. The Nationalist Party attacked land reform on the grounds that it would violate the rights of property and that the breaking up of large estates would hurt Lithuanian agriculture and damage her foreign relations. It suggested a maximum limit of some 730 acres. The then incumbent minister of agriculture, Jonas P. Aleksa, was also opposed to the 190 limit favored by the Christian Democrats. He advocated a limit of about 480 acres. Neither was there unanimity about the pace of the reform. Krupavičius called for haste, while some members of his own party wanted to proceed more slowly. The Lithuanian economist Albinas Rimka, who worked with Krupavičius in the land reform commission, was also opposed to a speedy reform. The Founding Seimas met on May 15, 1920 with the Christian Democratic block enjoying an absolute majority. However, in view of the grave situation in the country, the Populist Peasant Party was invited to join the governing coalition. The main task of the Founding Seimas was to write a constitution, but there was other important legislation awaiting it. One of its most important tasks was to write a land reform law. Necessity demanded that steps be taken to regulate the use of lands abandoned in the course of the war without waiting for a land reform law. Already the Lithuanian Council, before the convening of the Founding Seimas, had passed a number of administrative regulations. To pay volunteers for entering military service and the families of dead soldiers, a law was enacted granting such persons land in parcels of from 19 to 48 acres. About 13,000 acres were distributed in 1919. While awaiting the drafting of the basic land reform act by the committee on land reform, in 1920, the Founding Seimas adopted many preparatory laws, as the occasion demanded: laws regulating the sale of land and the rental of private farms; laws nationalizing forests, swamps, waters, and estates obtained in a privileged way; laws providing soldiers with land. On April 19, 1921, the basic land reform bill was introduced for debate by the Founding Seimas. It encountered severe opposition from several points of view. Its defenders, the Christian Democrats led by Krupavičius, first of all had to try to show that the land reform should preserve the right of private ownership, since this was demanded by the laws of human nature and 99% of those who were to receive the land. Secondly, it was necessary to defend the proposal that 190 acres be established as the legal maximum. In this respect, statistics from other countries were introduced demonstrating the superiority of small farms over large ones. Another issue was the question of church lands. The defenders of the bill argued that the church was a social organization and performed many useful functions. Thus, if other organizations were given land, why should church lands be completely nationalized and churches not have the right to own any land at all? Very controversial too was the question of compensation for expropriated lands. Krupavičius was of the opinion that a person is able by his own labor to acquire land up to some 480 acres. He argued, thus, that expropriated land which constituted a part of the first 480 acres of a holding be paid for at market value. Anything expropriated from a holding larger than 480 acres was to be paid for by a set fee, because land cannot be acquired justly in such large amounts. After intense debate, the land reform bill was enacted on February 15, 1922 by virtue of the votes of the Christian Democratic block and one independent delegate. The Social Democrats and members of the Populist Peasant Party voted against, while the Jewish representatives abstained. The Nationalist Party did not have any representatives at the Seimas. The land reform bill is being enacted in order to supply the landless and the small holders with land, to regulate the control of land in such a way as to create conditions for the development of agriculture and first of all of small and medium sized farms, and to nationalize that which the state can better use and safeguard than private individuals. To carry out the reform, a land fund was established. The fund took control of government lands, those owned by Russian noblemen, those owned by the peasant land banks, land confiscated by the Russians after 1863 and distributed to colonists, lands of private owners and their heirs who served in the armies of Bermondt and Virgolich, who have served or still serve in the Polish army, who have worked or work against Lithuanian independence, and lands which exceeded the 190 acre limit for each owner. Some 1,740,000 acres were placed under the control of the fund. Forests, peat bogs, and lakes were nationalized. Citizens of foreign countries, who had been in some special way by Russian laws allowed to own land outside the cities, were given the right to sell their holdings to a Lithuanian citizen within three years of the enactment of the bill. Owners whose lands were to be affected by expropriation were given the right to choose which 190 acres to retain, and this could include some 60 acres of woods. According to the act, the first to be expropriated were the largest and worst maintained estates. Farms no larger than 360 acres were to come up last in the distribution. However, if a farm was in a very poor condition, it could be distributed out of turn and its owner permitted to retain less than the allotment. The first to receive land were to be those landless and small holders whose lands had been taken away after 1861 and incorporated into estates. These were to be followed by soldiers who had volunteered or had been drafted by the Lithuanian government and had served honorably, and by the families of dead soldiers. After these came the employees of the estate being distributed, those who had lived and worked on that estate before the war; small holders with less than 24 acres and whose lands adjoined the lands of the estate being distributed; and those who rented land from the estate being distributed but not more than 120 acres. The landless were to receive between 19 and 48 acres each, depending upon the quality of the land, while small holders were to receive additions to bring them up to these limits. Village craftsmen, unable to maintain themselves solely by their craft, were to receive 5 acres each. It was planned to give lots, enough for a house, a garden, and an orchard to city employees, and employees of commercial, industrial, and other private firms, who did not own any real estate. Primary schools, agricultural schools, and other educational institutions were to receive not less than 7 acres each. Land was also set aside for hospitals, sanatoria, orphanages, for industrial purposes, for the enlargement of cities. Newly established parishes were to receive up to 19 acres. Everyone, except volunteers, had to pay for the land within 36 years, beginning in the ninth year from the granting of the land. During the first ten years of the holding, the land could be neither rented nor sold. It could be transferred only by inheritance. Payment for expropriated lands was established using 1910-1914 prices as a base. Most of the land in Lithuania was divided into strips. The strips of some villages were extremely narrow and, thus, there was a great deal of unproductive land on their edges. Furthermore, these strips made difficult the introduction of crop rotation. To improve the condition of agriculture it was important to break up the villages into individual homesteads. The land reform act intended to break up villages into homesteads. The land reform began, as has been said, in the summer of 1919. Up to June 1, 1922, this work was carried out by the departments of agriculture and land control, while after that date, by the Committee of Land Reform with departments of land reform, and land control, and the accounting office of the Committee of Land Reform. But the most important initiator of land reform was the minister of agriculture. Up to June 19, 1920, Juozas Tūbelis, a member of the Nationalist Party, served in that capacity. He was succeeded by Jonas Aleksa, and from July 2, 1923 to June 15, 1926, by Krupavičius. In the beginning, the distribution of land to soldiers, the landless, and small holders took place very slowly. In 1919, about 12,800 acres were distributed; in 1920, 41,500 acres; 1921, 50,600 acres; 1922, 35,500 acres; and in the first half of 1923, up. to the time Krupavičius took over the ministry of agriculture, some 13,800 acres. In three full years, 154,200 acres were distributed. The land reform speeded up considerably when Krupavičius became minister of agriculture. Already in the second half of 1923, the 195,300 acres distributed represent more than was distributed during the first three years. In 1924, 326,600 acres were distributed; 1925, 298,0000 acres; 1926, 182,500 acres. In the last year mentioned, land distribution decreased because Krupavičius served as minister for less than six months. Krupavičius had been especially anxious to distribute the estates because he had feared the intervention of foreign countries and pressure to slow down the pace of reform. This threat arose primarily from Polish landowners who were trying to save their own holdings. Accordingly, Krupavičius decided that two thirds of the effort should be directed towards the breaking up of estates, while a third, to the breaking up of villages into homesteads. The work was hampered by a shortage of surveyors. On November 13, 1929, the land reform act was amended: the maximum size of a holding was increased from 190 acres to 360 acres. A 1930 amendment relaxed the reform even further, making possible the use of various exceptions. According to the new law, 816 landowners retained from 216 to 360 acres, among them, 580 estates 336-360 acres in size. In this way, the land fund lost 384,000 acres. Furthermore, 3,480 acres were left for industrial purposes on the estates and an additional 14,-740 acres were given to landowners for expropriated land. In all, the land fund decreased by some 400,000.11 Since the land fund had decreased considerably, while the number of those desiring land remained the same, the agencies in charge of land reform had to find a way to satisfy the large number of requests from decreasing resources. New homesteaders and small holders received much less than the intended 19-48 acres. There was a shortage of land even to compensate volunteer soldiers, who according to the law had priority and, therefore, an amendment of the law in 1934 allowed monetary compensation, up to 4,800 litas per volunteer. In spite of such setbacks, the land reform did change extensively the patterns of Lithuanian society, particularly during the years Krupavičius directed the program. Up to January 1, 1940, 38,747 parcels of land of various sizes, totaling some 869,100 acres, were distributed to new homesteaders, including 10,630 volunteers. Small holders received 26,367 parcels of land, totaling some 217,500 acres. In all, if we include land given to various institutions and distributed as lots for building, 73,919 parcels of land were distributed, totaling some 1,101,600 acres. * With regret, the editor notes that Mr. Pauliukonis died while this article was being translated into English and did not see the version here published. The editor is responsible for certain omissions from and additions to the manuscript. Many of these changes were made on the basis of another essay by Mr. Pauliukonis on the same topic, "Prel. Mykolas Krupavičius ir žemės reforma," ("Msgr. Mykolas Krupavičius and the Land Reform"), Tėvynės Sargas (The Guardian of the Fatherland), 1968. 1 St. Kairys, Lietuva Budo (Lithuania was Awakening), p. 302. 3 Draugija (Association), no. 1, 1907, pp. 75-76. 4 Draugas (The Friend), for October 8, 1955, part 2. 5 Strictly speaking, the Christian Democratic block, which consisted of three Catholic parties, the Christian Democratic Party, The Farmers' Union, the Federation of Labor. 6 Draugas, for October 8, 1955. The same Lithuanian word is in the first case translated as "landowner" and in the second, as "mister." The same word both means landowner and is the common courtesy title, used in the same way as "mister" in English. 7 The Lithuanian manuscript gives all land areas in hectares. These were converted into acres and rounded off. 8 The Populist Peasant Party was a liberal, democratic party. 9. This party had some tendencies towards fascism. After it seized power in 1926, it introduced a mild dictatorship, shut down all other political parties, and restricted the freedoms of the press, speech, and assembly. 10. Žemės Ūkio ministerijos Metraštis (Yearbook of the Ministry of Agriculture), 1938, pp. 322-323. 11 Lietuvos Statistikos Metraštis (Yearbook of Lithuanian Statistics), 1939.